Who’s hungry? Reality in Scale has just released a new 1/35th scale resin accessory set that should help if you or anyone hanging around your workbench answered in the affirmative. The two castings depict exactly what you would think; a pile of food supplies. The casting material is very nice, no pinholes or issues whatsoever. The resin is nice and smooth for things that should be smooth and has a nice fine grained feel to all of the items that are some sort of cloth type material. Both of the castings are of several crates, bags, sacks, etc, in a single attached conglomeration. One of the two is a bit unique in that it includes a couple of nice chunks from a wheel of cheese, they are cast with the holes in them so I am guessing Swiss cheese, clearly NOT Velveeta. The other casting is a bit more standard, several bales, a collection of sacks, and a few smaller bags (flour?). The decals are provided to bring a little extra life to the whole thing. Seven different decals provide markings for a couple of different sizes of tea bales (or crates perhaps). Also, a couple decals for the aforementioned wheels of cheese, a coffee decal, and a few that I am not sure of but may be something like inventory markings or such. I like the set, the castings themselves are very nice, the grainy feel to the fabric portions are a welcome addition. The decals add that extra little splash of color and help to set the whole thing apart. Either, or both, of these pieces would look great in a multitude of modeling situations. Highs: High quality castings free of any imperfections. Decals add a nice touch and a bit of life to an otherwise mundane subject. Lows: Only two pieces, would be nice to include some smaller, single castings. Verdict: Recommended, can be used to fill dead space or the back of a truck. Good review, Rick! 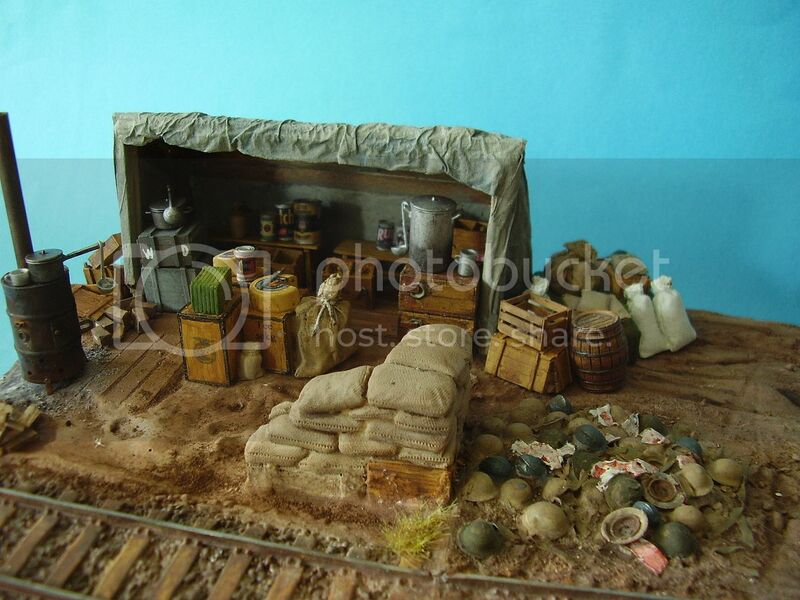 And a nifty set of things for any diorama.